Another morning with sewing ahead of me – but not too much! Just a touch here and then, thread trimming, ironing, and finally wrapping. 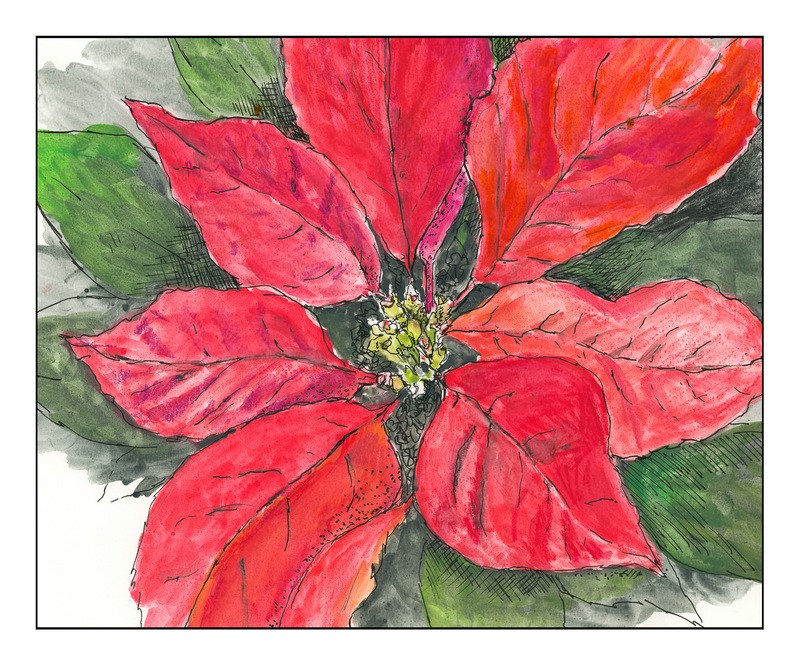 To start my day – after coffee, breakfast, a review, and the news – I decided to use my watercolor pencils, InkTense blocks, and Neocolor II by Caran d’Arche to draw the classical Christmas / holiday poinsettia, and some permanent black ink. Did you know the red is really the leaf and the little yellow dots in the center are the flowers? Poinsettias are not only crimson, but come in pale pinks and whites. And, they are easy to grow – just take a cutting, let it dry out until hollow, and stick in some dirt, and you may be ready for next year! I think they may also be poisonous . . .